Over the past 50 years, Episcopal has gone from trying to “keep up with the times” to prioritizing inclusion and diversity (Hoxton Letters-EHSHP.org). Without learning from the struggles of minority students in the past, the school would not have been able to keep pace with our ever-evolving social climate. Now, the school is focused on making Episcopal a place where all students feel welcomed, included, and respected. In order to make Episcopal a welcoming environment for all, the school has instituted affinity groups for minority students, is proactively trying to increase the diversity among faculty and staff, and has broadened the authors and perspectives studied in history and English classes. This page goes deeper into how Episcopal has increased diversity on campus and the steps the school has taken to make Episcopal more inclusive. This chart illustrates the percent of the Episcopal student body that is African American, other minorities, and white. The columns on the left of the white space represent the first fifteen years of integration at EHS and the columns toward the left represent the most recent years. 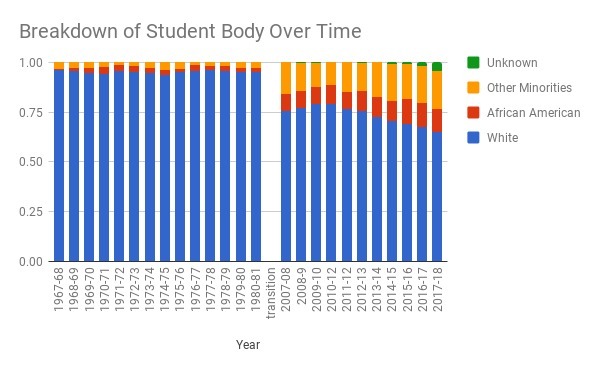 This chart is out of one because the student body has vastly increased since 1968 and the most accurate way of comparing the diversity from then to now is through percentages. Over the past 50 years, there have been 116 African American monitors and 21 Honor Committee members. While this number might seem disproportionately low, it should also be remembered that these leadership positions are held by seniors and during the late 1900’s to early 2000’s it was common to only have between one and eight African American students in a grade. Look below to see how the percent of African American Leadership has evolved over the past fifty years. 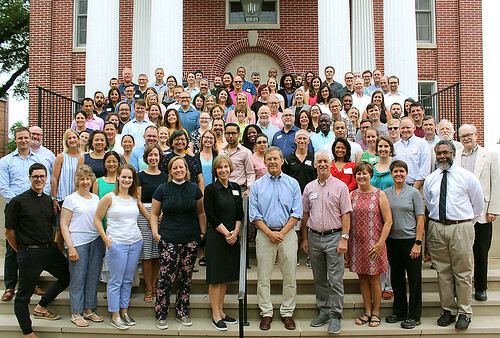 Having a diverse and inclusive faculty and staff has recently been a major focus of Episcopal. Over the past ten years, this focus has had two outlets. First, the school has sent as many faculty as possible to the White Privilege Conference, NAIS People of Color Conference, and to SEED, Seeking Educational Equity and Diversity, training. These programs give teachers an "opportunity to learn about oneself, one’s biases, and how one’s background influences behavior in and out of the classroom", and the training has kept EHS faculty on the forefront of inclusion research in boarding schools. Also, the school has been focused on increasing diversity among faculty. This year, the class of new teachers “that are coming in for the 18-19 school year, out of the nine hired six are teachers of color”(Fielder Interview-EHSHP.org). Episcopal’s emphasis on creating a diverse curriculum is another example of Episcopal evolving over the past fifty years. In an interview with Mr. Rodney Robinson ‘86, he remembered asking his English teacher “why they couldn’t read poets like Langston Hughes” and being told that “the curriculum could not be changed” (Robinson Interview-EHSHP.org). Now, according to Ms. Mary Fielder, Assistant Head of Academics, Episcopal has “increased the exposure and study of a more diverse set of text and broadened [its] understanding of what history looks like by focusing less on eurocentric history” (Fielder Interview-EHSHP.org). By offering opportunities for teachers to attend conferences focusing on inclusion, increasing the percentage of minority faculty members, and broadening the history and English classes to have a less European focus, EHS is actively addressing issues of inclusion and transforming Episcopal into a welcoming environment for all.